Their well-organized protests show younger teens are ready. 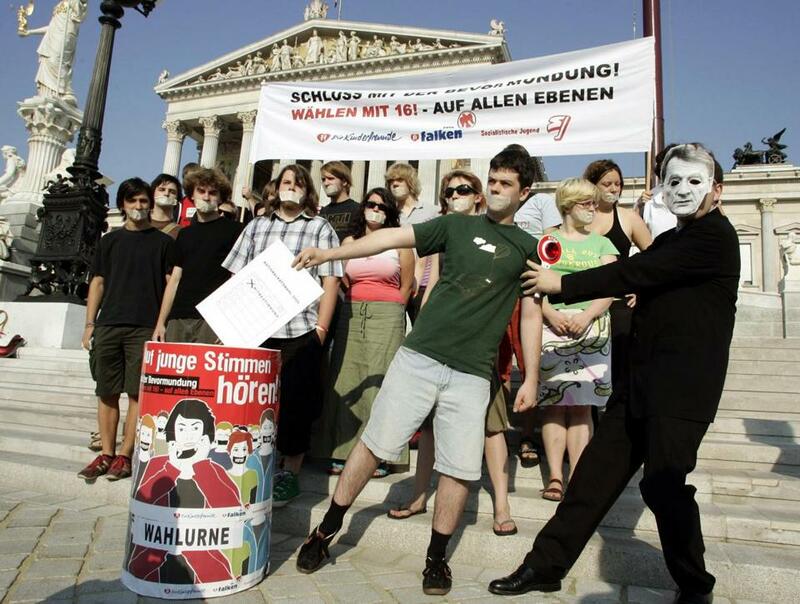 Austrian 16-year-olds demanding the vote in front of the Parliament building in Vienna in 2006. Old enough to fight, old enough to vote. That slogan summed up the case in 1971 for giving the vote to 18-, 19- and 20-year-olds, many of whom were serving in Vietnam. The 26th Amendment, which allowed US citizens 18 or older to cast ballots, was ratified faster than any before it. Now, 47 years later, with a war over guns at home and those weapons of war being used to mow down children and teenagers, it’s time to lower the voting age again — this time, to 16. Can anyone seriously doubt that the shooting survivors in Parkland, Florida, and thousands like them, possess the sophistication and focus to cast a ballot? While adults in Congress have allowed massacre after massacre and done nothing, these teens have relentlessly demanded action. While adults have tolerated polite deceit from politicians, high schoolers have scorned business as usual. Protests like the one in Parkland have spread to high schools around the nation, including a number in the Boston area, in advance of a planned March 14 national walkout. While adults have allowed themselves to be purchased by the National Rifle Association, these kids have rejected the mindless “now is not the time” mantra of reform-avoiders. To those who say these teens are not ready for the vote, I join Marjory Stoneman Douglas student Emma Gonzalez in calling BS. Their readiness is just one of many reasons to adjust the electoral equation: Voting, not surprisingly, is habitual — start young and you’re more likely to keep doing it. Don’t vote young, and you’re less likely to vote as you get older. Research from Denmark suggests enfranchising the young is a twofer: Parents are more likely to go to the polls if their teens who live at home do. There are arguments against giving 16-year-olds the vote, or more precisely one tired, old argument: They lack the experience and maturity of older voters. Really? You mean the same adults who have voted for deficit-exploding, inequity-expanding, discrimination-tolerating politicians? Accepted inaction on guns, a retreat on health care, and lower nutrition for the poor? Practiced puerile partisanship that would embarrass a teenager? Could young voters do any worse? Unlike far too many adults, today’s high schoolers will turn out at the polls. They do in countries like Argentina, Austria, and Brazil, which allow 16-year-olds to vote. Participation in those places among younger voters is generally higher, sometimes significantly so, than among their 18 to 21-year-old compatriots. In an independence referendum in Scotland in 2014, where 16- and 17-year-olds were allowed to vote, 75 percent exercised their right. On this side of the Atlantic, turnout for midterm elections just two months later by those 18 and older was 36 percent, the lowest in 70 years. Did I ask, could kid voters do any worse? I’ve never been accused of being ahead of any curve, but as a Cambridge city councilor in 2000, I proposed lowering the voting age to 16 in school committee elections. Like most of what I championed in my one term, it went nowhere. But after I was out of office, a proposal to let 17-year-olds vote passed 8 to 1, thanks to the advocacy of students at Cambridge Rindge and Latin. The home rule petition died on Beacon Hill. So Cambridge lost out to Takoma Park, Maryland, which allowed 16-year-olds to vote in its general elections starting in 2013. Those under 18 voted at four times the rate of older residents. So, that’s one. My calls to Paul Ryan and Mitch McConnell, though, produced just what calls for reinstating the federal assault weapons ban has: crickets. While we await a debate on this electoral expansion on Capitol and Beacon Hills, we’ll continue to be treated to the stunning courage and wisdom of teenagers contrasted with the cowardice and cluelessness of so many legislators selected to represent us. Maybe we should pursue one more reform: Give 16- and 17-year-olds the right to vote and take it away from everyone else. Could they do any worse? Jim Braude hosts Greater Boston and co-hosts Boston Public Radio on WGBH. Send comments to magazine@globe.com. Follow us on Twitter @BostonGlobeMag.